Trending at $25.99Trending price is based on prices over last 90 days. 2019 ISSUE MATCHBOX NEW FORD TRUCKS SERIES MOON EYES '56 FORD F-100! MATCHBOX 55 FORD F-100 DELIVERY TRUCK IN BLUE NICE!!! Matchbox Collectibles 1955 Ford F100 Pickup Models of Yesteryear YRS06/B-M! 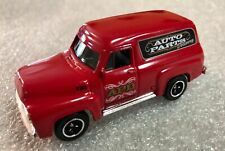 Mattel Matchbox 1953 Ford F 100 Tow Truck 4.5 inches long. This page was last updated: 20-Apr 21:59. Number of bids and bid amounts may be slightly out of date. See each listing for international shipping options and costs.